The climate of Finland is characterized by long, cold winters and short, mild, and moderately rainy summers. Among the Scandinavian countries, Finland is the one with the coldest climate because of the proximity to Russia. Across the country, precipitation is not very abundant, and it ranges from 400 millimeters (15.5 inches) per year in the extreme north-east, to 650 mm (25.5 in) in the east and south, to 700 mm (27.5 in) in the south-western tip (see Turku); however, it is quite frequent and well distributed throughout the year. The rainiest periods are summer and autumn. In the center-south, August is generally a bit rainier than July. The least rainy (and snowy) period is the one that runs from February to April. In winter, light snow often falls, which may not even be counted in the statistics (if it does not reach a minimum amount of equivalent rain). Finland is largely a flat country. However, in the north, there are hills, and in the extreme north-west, on the border with Norway, even a mountain, Halti, 1,324 meters (4,344 feet) high. Winter is long and cold throughout the country; it lasts almost five months even in Helsinki, which lies in the far south. Here, the temperature remains almost constantly around or below freezing (0 °C or 32 °F) from mid-November to late March. As you head north and east, winter gets even colder and longer. The numerous lakes that are located in Finland are frozen, and even the sea can sometimes freeze (more often in the Gulf of Bothnia, but sometimes, even in the port of Helsinki and in the eastern part of the Gulf of Finland), and it is necessary to resort to icebreakers to allow maritime traffic to continue. During winter, the weather can vary greatly depending on meteorological conditions: when Finland is affected by cold air masses from neighbouring Russia, the temperature drops below -20 °C (-4 °F), on the contrary, when it is reached by mild winds from the Atlantic Ocean, the temperature remains around the freezing point. On colder periods, the temperature can fall to as low as -50 °C (-58 °F) in the far north (Lapland). In January 1987, the temperature reached -35 °C (-31 °F) even in the "southern" city of Helsinki. The thaw usually occurs in April, at the beginning of the month in southern Finland, and at the end of the month in Lapland. In autumn, the snow normally begins to fall in October in Lapland, and in November in the south. May and September are two transitional months, during which the night temperatures are usually around freezing, and the only months with a mild weather are the three summer months, from June to August, when it can even get hot during the day. In this season, the vegetation grows rapidly, to take advantage of the short period of mild temperatures, while mosquitoes literally invade the landscape. In Lapland, the daytime temperatures during summer are similar to those of the rest of Finland, around 20 °C (68 °F), and with peaks around 30 °C (86 °F), while nights remain cool or even cold, in fact, minimum temperatures typically remain below 10 °C (50 °F). In Lapland, the northernmost part of Finland, the climate is cold for most of the year, with a short and intense summer. Here, the winter (which in Nordic countries is the season when the temperature remains below freezing) lasts seven months, from October to April. The days are very short from November to January, and in December, you almost never see the sun, also because of the cloud cover. Summer is mild, with some warm days, while at night, it can get cold. July is the warmest month. In summer, the days are very long: in June and July, there's the midnight sun, while in August, even though the days begin to shorten, it never gets completely dark. In northern Lapland, well beyond the polar circle, we find Ivalo. Here, during the coldest winters, the temperature drops below -40 °C (-40 °F). The cold record is -49 °C (-56 °F) and has been set in January 1999. During summer, the temperature can occasionally reach 28/30 °C (82/86 °F), but in other periods, it can drop below 5 °C (41 °F) at night. Here are the average temperatures. Precipitation in Ivalo is not abundant, just 430 mm (17 in) per year; however, in winter, there are often light snowfalls. Summer is the wettest season, with 60/65 mm (2.4/2.6 in) per month in July and August. During summer, fog can form at night and in the early morning. In Ivalo, the sun stays all day under the horizon from December 4 to January 8, while it never sets from May 24 to July 22. Rovaniemi, the capital of Lapland, is practically located at the polar circle, in the southern part of the region (therefore, the least cold). Here are the average temperatures. In Rovaniemi, precipitation amounts to 580 mm (22.8 in) per year. The wettest season is summer. In winter, snowfall is quite frequent but generally light. Snow generally covers the ground from the beginning of November to May 10, with a maximum of 55-60 cm (1.8-2 feet) from late February to early April. The sun in Rovaniemi does not set at all from around June 7 to July 6. On the contrary, in winter, there is no period when the sun never rises (around December 22, the sun is slightly above the horizon for about 2 hours and a quarter). However, given the briefness of the days and the frequency of cloud cover, in winter the sun is almost never seen, while in June and July, it shines roughly 37% of the time. Here are the average sunshine hours per day. In the center-south, winter is less cold than in Lapland; however, it remains freezing, with averages well below 0 °C (32 °F). The Gulf of Bothnia, especially in the northern part, is not able to temper the climate by much because in winter it is often frozen. Summer is mild or pleasantly warm, and a little warmer than in the north, especially at night. In Oulu, on the coast of the northern part of the Gulf of Bothnia, 170 km (105 mi) south of Rovaniemi, the average January temperature is -10 °C (14.5 °F). Here, the temperature dropped to -37.5 °C (-35.5 °F) in January 1987. Here are the average temperatures. In Oulu, 475 mm of rain or snow fall per year. As usual, precipitation is well distributed throughout the year, at least as regards to the frequency, while July and August are the months when the rains are more abundant. Here is the average precipitation. In Oulu, the sea temperature from January to April is near the freezing point (remember that the sea freezes at about -2 °C or 28.5 °F). In summer, the sea remains cold. Further south, in Vaasa (on the coast) and Kuopio (in the interior), the climate is similar to that of Oulu, just slightly milder. Further south, in Tampere, located in the inland southern area, the average temperature ranges from -7 °C (20 °F) in February to 17 °C (62.5 °F) in July. In Tampere, precipitation amounts to 600 mm (23.5 in) per year. As usual, July and August are the wettest months, with 70/75 (2.6/3 in) mm of rain per month. The capital, Helsinki, is located in the southernmost and mildest part of the country. However, the temperature remains around or below freezing for a few months every year. Generally, the snow covers the ground from December 10 to April 10, with a maximum of 20/25 cm from late February to late March. Here are the average temperatures. In Helsinki, precipitation amounts to 650 mm (25.5 in) per year. Here is the average precipitation. The sun in Helsinki is rarely seen from November to January, while from May to August, it shines about half the time (compared to the length of the day). The white nights in Helsinki occur roughly from May 12 to August 2. The sea in Helsinki is a little less cold than in the Gulf of Bothnia, but as mentioned, it can sometimes freeze here as well. In summer, the sea remains cold; however, it reaches 17 °C (63 °F) in August. In Turku, on the coast exposed to the south-west, the climate is similar to that of Helsinki. Summer, from June to August, is the best season to visit Finland. Temperatures are generally good for outdoor activities, hovering around 18/22 °C (64/72 °F), at least when it doesn't rain (in the evening or during rainy days it can be cooler), while it rarely gets hot, even though sometimes the mercury reaches 28/32 °C (82/90 °F). 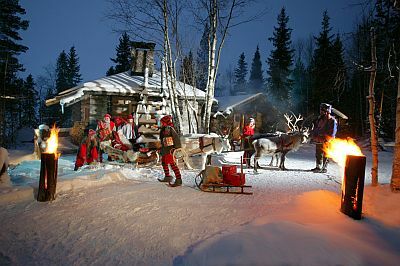 However, sometimes at night it can get cold, especially in Lapland. The days are very long, especially in June, when you can admire the "white nights" in the south, and the midnight sun in the north (see Rovaniemi and Lapland). June is not as rainy as July, but it's a bit cooler. It is worth while to recall that in Nordic countries the summer generally begins to decline by mid-August: the days get shorter (even though they remain long), and are both a slight decrease in temperature and an increase in the number of rainy days. The sun in Finland does not shine very often, even in summer, when there can be some rainy or cloudy days, but at least, the sky is not always overcast in this season, and the sun often peeks through the clouds. If you want to visit Finland in its winter appearance, the best month is March, when the country is still covered with snow, but the temperature is milder, and the days are longer than in the previous months. Easter can be a good period, even when it is advanced, to go cross-country skiing in the north and to take advantage of the longer days, while hoping for the sun to come out. In the period from December to February, in addition to very short days (in the Christmas period, the sun doesn't even rise in the north), sometimes, there can be a bitter cold, even in the south, especially in January and February. In this period, however, you can experience the polar nights in the north and go in search of the northern lights (Aurora borealis). By February, the days start to become longer. In winter: bring cold weather clothing, synthetic, thermal long underwear, a fleece, a parka, a wind jacket, gloves, and warm boots. In summer: bring clothes for spring and autumn, being ready to add or remove the outer layer, a T-shirt, but also long pants, a jacket, a sweatshirt or sweater, and a raincoat or umbrella.